Rate depends on the number of bedrooms you occupy. This wonderful apartment, decorated in a fresh contemporary style, is the perfect oasis from which to venture out into the bustling streets and plazas of the historic center and explore its many impressive buildings and museums on foot. The 'Centro', as the locals call it, was declared a World Heritage Site in 1991. It is chockfull of Aztec and Colonial treasures, fascinating museums, busy shopping streets and markets, and plenty of restaurants and bars. Here you feel the throbbing pulse of this great megalopolis - and all just a few steps away from your apartment. 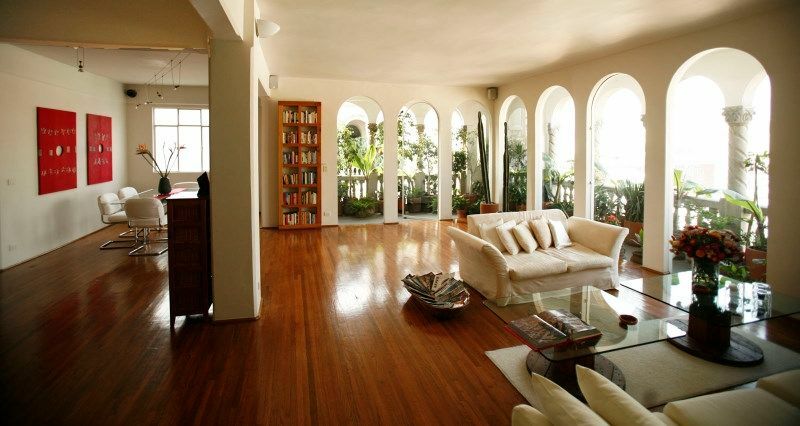 Located on the top floor of a stately building, this penthouse offers breathtaking views of major Mexico City landmarks. It has an enormous living area with a plant-filled terrace, four charming bedrooms, three and a half marble baths (one with jacuzzi), and a modern well-equipped kitchen. It comfortably accommodate seven guests. Cost of renting the apartment depends on the number of bedrooms you occupy. Rates start at €200/night for a dble bedroom and go up to €340/night for the entire apartment (7 guests, 4 bedrooms). You will always have exclusive use of the apartment - even if you rent just one or two bedrooms. No sharing with other guests! Pls see detailed ratesbelow. Minimum stay is three nights. During Easter, Day of the Dead, Thanksgiving and Xmas/New Year holidays, minimum stay is four nights. Also, rates increase during those time periods. Please see our seasonal rate list under "Rates." Petra, the owner lives in the building. She wants her guests to feel at home and personally attends to their needs and special wishes. A producer of documentaries on Mexico, she is an expert on unusual destinations and activities and will gladly assist you in planning your Mexican vacation, both in Mexico City and the rest of the country. We can arrange for private tours to many sights in and around Mexico City, in-house cooking lessons and tequila/mezcal tastings, in-house Spanish classes and massages, and a private cook for dinners at your apartment. Please ask us for our list of activities and excursions. Includes full Continental breakfast and daily maid service except Sundays and official Mexican holidays. No end-of-stay cleaning fee. € SEASONAL RATES (minimum stay 4 nights) for Easter, Independence Day, Day of the Dead and Thanksgiving weeks, and for end-of-year holidays. Petra, the German owner (she speaks German, English, Spanish and French) has lived and worked as a journalist in Mexico for nearly 30 years. When authorities began to spruce up the decaying Centro Histórico more than ten years years ago, she bought two apartments on the top floor of a stately building between the Zocalo and Bellas Artes. Before moving in, she totally remodeled, modernized and redecorated both properties – one to live in herself, the other to put up friends, relatives and paying guests when visiting Mexico. 4 phones - 1 phone line. Cell phone (Mexico City number) on request. No air conditioning (at an altitude of 2,400 m you don't really need this), but floor fans in every room. Electric and gas space heaters. You'll rarely need them.... Plus electric mattress pads on all beds during the cold months (November through February). We also offer laundry serice, including ironing. In-house parking for one car (regular sedan only) can be arranged at extra cost. Seats 8. Additional tables and chairs - for special events - can be rented. Satellite TV, flat screen, plus DVD player in three bedrooms (Aviones, Peces and Toro). Stereo and radio In living room. There are dozens of books in the apartment, including travel guide books on Mexico in several languages. You can also choose from hundreds of books in owner's private library. Scrabble and other games in apartment. There are some CDs in the apartment. You can also choose from hundreds of CDs in owner's private CD library. There are dozens of videos in the apartment. You can also choose from hundreds of DVDs in owner's private video library. Wrap-around terrace in living room. OPTIONAL: Laundry service, in-house parking (1 car), private cook, Mexican cooking classes, language seminars, massages - ALL IN YOUR APARTMENT!. Owner will gladly share her knowledge of Mexico (the city AND the country) with you, give you travel and other tips, and help you arrange activities and excursions. We are grateful to Petra for welcoming us and providing tips, tours, humor, transportation, and a beautiful place to stay. We loved the views from the penthouse, your walking tour, all the restaurant and neighborhood recommendations, the trip to Teotihuacan, and watching the James Bond movie. We were a group on 7 (3 couples, one 9-year old) and all fit well, some shared bathrooms, did take Petra up on the pads for the beds, and the bathrooms had plenty of hot water. Petra and Ceci helped with every possible request that crossed our minds! Hope to be back before too long. Thank you so much for your hospitality. It was a perfect set up for our group of five, each having private rooms and baths and still having a private visiting area to have our coffee or happy hour. Petra was very friendly and helpful without being the least bit instructive. We would definitely stay here again! The apartment was in a perfect location to enjoy the historic center of the city. The apartment was perfect for our family, but what really made our stay memorable was the incredible hospitality of Petra and her staff. Her warm welcome and easy access made our first trip to MC seamless. Petra’s restaurant recommendations, setting up our pyramid tour, airport transportation and setting up our incredible dinner with Ceci made our vacation. Thank you, Craig, to you and your lovely family for staying with us and for taking the time to write such a great review. Hope to see you again - if not in Mexico then in Alaska. From your descriptions, Alaska must be a wonderful place for a holiday for us -- just as Mexico was for you. Petra was extremely responsive and very informative on what was located immediately around the penthouse, offered site seeing recommendations based on what our interests were, and provided recommendations for available drivers to take us too and from the out of town excursions. There was so much information exchanged and shared that upon arriving, that we wasted no time in trying to 'figure things out' during our stay. We were welcomed by Petra and Ceci and immediately provided with a brief tour of the penthouse, which has everything you would need for a short or long term stay. Everything in the penthouse provided the comfort we needed after very long day's of sightseeing, while everything you may need (ATM's, convenience stores, shopping, etc.) are all within a very short walking distance. We were again greeted by Petra and Ceci prior to departing and asked about our stay. Further recommendations for driver or taxi service to the airport were again provided to us which made everything from our arrival to departure nothing less than a flawless process. Everything about this trip was perfect. The hospitality, accommodations, and location are all what make this place a true gem in Mexico City that everyone should have the opportunity to experience. I took my grand-daughter to Mexico City to introduce her to the beautiful Mexican culture and to meet relatives. My nephew, nieces and sister also joined us. I really wanted this to be a memorable and perfect trip. And it was! Petra's home was the perfect house with the perfect location and Petra was the perfect host.When arranging the reservation she was in constant communication with me making sure every thing was in place. She arranged for the driver to provide transportation to and from the airport and she was at the house to greet us when we arrived. We were able to arrange tours with her which made it so easy for us. We knew we were in good hands. She has a wonderful cook who helped us with a very special dinner for our relatives. I have rented many homes through vrbo which were very nice, but this home was a jewel perfected by Petra! Private Mexican cooking lessons, meals prepared by private cook, Spanish classes, massages, tequila and mezcal tasting -- all in your apartment. For details, please contact owner. RATES FOR EXCLUSIVE OCCUPANCY OF APARTMENT No end-of-stay cleaning fee K – 1 king or 2 twin beds: Q – queen bed; T – twin bed € BASE RATES (minimum stay 3 nights) 1 bedroom (K), 1.5 bath----------------200/night, 1,200/week – Plan B 2 bedrooms (Q, K), 1.5 bath-----------225/night, 1,360/week – Plan C 2 bedrooms (K), 2.5 baths -------------270/night, 1,600/week – Plan D 3 bedrooms (2K, 1Q), 2.5 baths-------315/night, 1,890/week – Plan E 4 bedrooms (2K, 1Q, 1T), 3.5 baths---340/night, 2,040/week – Plan F € SEASONAL RATES (minimum stay 4 nights) for Easter, Independence Day, Day of the Dead and Thanksgiving weeks, and for end-of-year holidays. 1 bedroom (K), 1.5 bath----------------215/night, 1,300/week – Plan B 2 bedrooms (Q, K), 1.5 bath-----------240/night, 1,450/week – Plan C 2 bedrooms (K), 2.5 baths ------------280/night,1,680/week – Plan D 3 bedrooms (2K, 1Q), 2.5 baths------330/night, 1,980/week – Plan E 4 bedrooms (2K, 1Q, 1T), 3.5 baths--360/night, 2,160/week – Plan F USD BASE RATES 1 BR (K), 1.5 baths …………..……...220/night, 1,350/week – Plan B 2 BRs (1Q, 1K), 1.5 baths …………250/night, 1,500/week – Plan C 2 BRs (2K), 2.5 baths…………….….300/night, 1,800/week – Plan D 3 BRs (2K, 1Q), 2.5 baths………..…350/night, 2,100/week – Plan E 4 BRs (2K, 1Q, 1T), 3.5 baths........380/night, 2,300/week – Plan F USD SEASONAL RATES 1 BR (K), 1.5 baths………………..…240/night, 1,450/week – Plan B 2 BRs (Q, K), 1.5 baths…………….270/night, 1,600/week – Plan C 2 BRs (K), 2.5 baths…………….…..320/night, 1,950/week – Plan D 3 BRs (2K, 1Q), 2.5 baths………..370/night, 2,250/week – Plan E 4 BRs (2K, 1Q, 1T), 3.5 baths-….400/night, 2,400/week – Plan F Seasonal rates: Balance (2nd payment) is due two months prior to arrival. Please note that there is a USD20 fee for check-in/out between 9 pm and 9 am and on Sundays and official Mexican holidays.